"It's not paranoia if they're really after you." 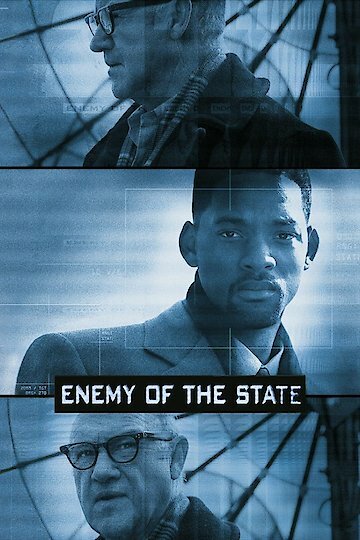 Enemy of the State is an action thriller movie with a hint of mystery movie thrown in. Life takes an unexpected turn for the dramatic when ordinary Joe and labor lawyer Robert Clayton Dean (Will Smith) briefly runs into an old college friend. Unknown to Dean, wildlife researcher Daniel Zavitz has accidentally taped a politically motivated assassination by a rogue American government unit and is fleeing for his life. Zavitz slips a copy of the incriminating evidence into Dean's shopping bag, making Dean a target of corrupt and powerful forces after Zavitz turns up dead. When the rogue National Security Agency unit cannot find the copy of the video, they plant incriminating evidence on Dean which results in his bank accounts being frozen, his wife throwing him out and his boss firing him. With his life torn asunder and no idea why, his only hope is mystery man Edward Lyle (Gene Hackman). Lyle is a former government operative, savvy about all the insidious ways that government intelligence can be misused and go awry. He is a no nonsense sort of man with a no holds barred, take no prisoners and leave no stone unturned approach to coping with government forces run amok. Lyle's paranoia and thoroughness are saving graces in what should be a hopeless situation. After a phone call by Dean results in Lyle having to torch his entire base of operations, Dean gets a rapid and thorough education in exactly what they are up against. Fortunately, he is a quick learner because the two of them really cannot afford too many "little" mistakes with a cost of that order of magnitude. Lyle tries to convince Dean to just give up on justice and flee the country but Dean is determined to clear his good name. Together, the two manage to outsmart and outmaneuver rogue agents, corrupt politicians, and a group of Mafioso. They turn the tables and plant incriminating evidence against some of the involved parties, arrange blackmail and fool the mafia and corrupted NSA unit into engaging in a very deadly meeting based on lies and misdirection. Although much of the evidence is destroyed along the way, the corrupt political plot is stopped and Dean gets his life back. Lyle leaves for a tropical island. In spite of long odds against justice, it all turns out okay. Enemy of the State is currently available to watch and stream, buy on demand at Amazon, Vudu, Google Play, iTunes, YouTube VOD online.